More good news are here for the K2 component users. Our popular K2 search and filter extension now supports advanced keyword search options as well as search item highlighting in the results. In the world where everyone is familiar and comfortable with Google Search, why not extend some of its feature in our search? By default the search support is for exact phrases with quotes (“search”). We believe that a single operator is not enough for content searching, and the usage of Google search like operators in keyword search will ease the pain when it comes to content filtering and searching. 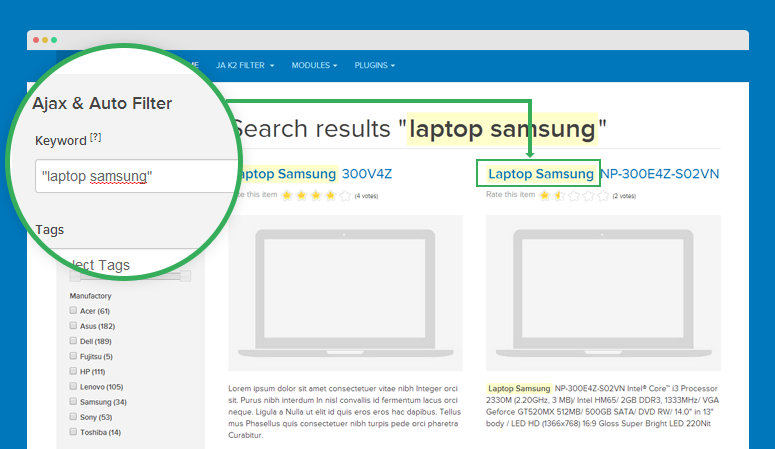 We decided to remove the Search Mode field, and implemented advance search for keywords. With this, you can now use multiple operators in keyword search like one can use in Google. "search" Search for an exact word or phrase Use quotes to search for an exact word or set of words on a web page. This is helpful when searching for song lyrics or a line from a book. But only use this if you're looking for an exact word or phrase, otherwise you'll exclude many helpful results by mistake. -search Exclude a word Add a dash (-) before a word or site to exclude all results that include that word. This is especially useful for words with multiple meanings, like Jaguar the car brand and jaguar the animal. * Fill in the blank Add an asterisk within a search as a placeholder for any unknown or wildcard terms. Use with quotation marks to find variations of that exact phrase or to remember words in the middle of a phrase. "a * saved is a * earned"
OR Search for either word If you want to search for pages that may have just one of several words, include OR (capitalized) between the words. Without the OR, your results would typically show only pages that match both terms. item contains these words "world cup location 2014"
or "world cup location 2018"
or "world cup location 2022"
intitle: Searches for a single word or phrase in the title of the search result. There are 2 notes when using the operator. There is no space between intitle: and the following word. Google will restrict the results to pages that have the query word or phrase in the title of the document. Find information about the use of robots in the production of Toyota vehicles. Find information about RSS feeds provided by the MIT Libraires. Here they are, all the search results on Dell laptop, without the core i3 processors. 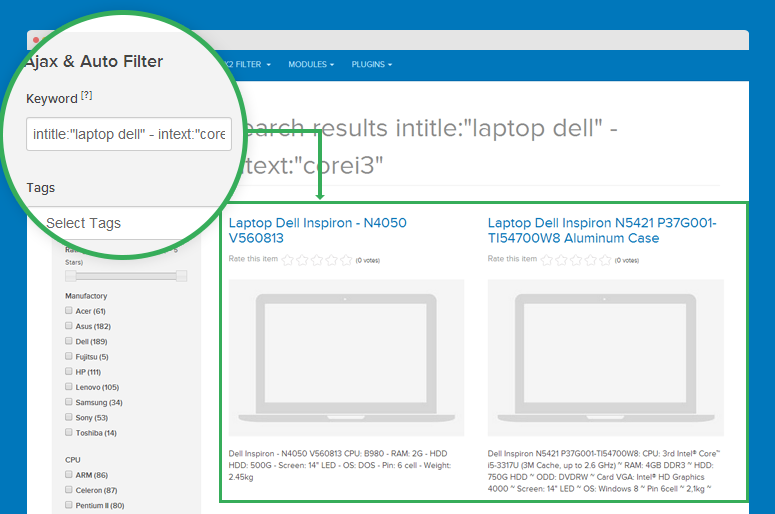 Along with Advance keyword search, JA K2 Filter now supports highlighting search term. This feature highlights the keyword in search results. Normally, the Filter by keyword of K2 Filter will search in all fields: title, intro text, full text, image caption, image credits, video caption, video credits, meta description, meta keywords. In version 1.1.4, we add the Search In Setting option to allow admins to configure specific fields to conduct the search. This way admins can better manage the search and filter functions of JA K2 Filter. 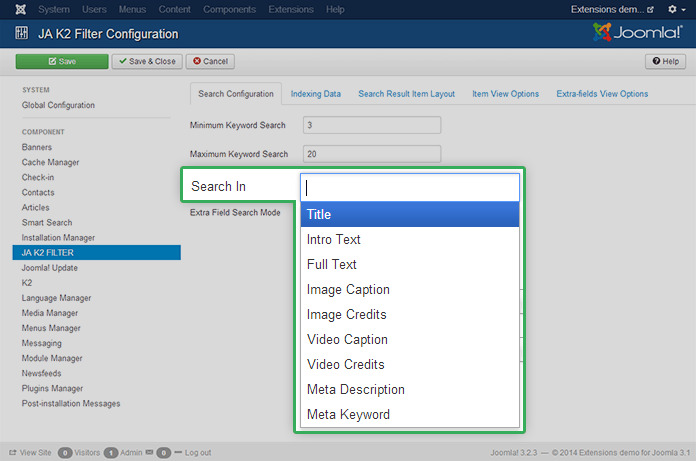 With these new features, we want to take the content search experience in K2 component of Joomla to a whole new level. Have you tried the new JA K2 Filter? We’d love to hear your thoughts and feedback, please tell us in the comments below.